To ensure maximum safety and comfort, you should never use a syringe more than once. For more details, read about the risks of needle reuse. To expose plunger, twist white cap to break seal, then pull off. To expose needle, twist orange cap to break seal, then pull STRAIGHT off, being careful not to bend the needle. To measure correct dose, align top edge of Thin-Line plunger tip with your dosage mark on the syringe scale. Use once only. To prevent misuse after injection, destroy syringe needle and contain. Dispose of used products in accordance with local law and ordinances. 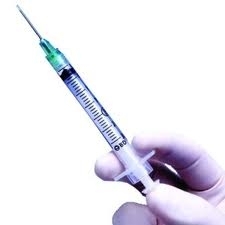 If you inject someone else or dispose of someone else's syringes, extreme caution must be exercised to avoid accidental needle sticks which can transmit serious even grave infections. Do not recap or clip someone else's syringe needle. As soon as possible place used syringe, intact in a safe container. For patients who mix two types of insulin, do not change the order of mixing that the physician has prescribed or the model brand of the syringe or needle without first consulting your physician or pharmacist. Failure to heed this warning can result in dosage error.